President Donald Trump has awarded the Medal of Honor, the military's highest award for heroism, to deceased Army 1st Lt. Garlin "Murl" Conner, more than 70 years after he fought in World War II. His wife, Pauline Conner, accepted the award Tuesday on his behalf. Conner was wounded seven times in battle, and in January 1945, he raced ahead of American lines to call in artillery strikes on an overwhelming onslaught of German forces outside Houssen, France. When Pauline Conner first saw her future husband Garlin Murl Conner shortly after World War II had ended in 1945, she didn't quite understand why the town was making such a big deal about such a scrawny guy. "I said to mother, 'My God, that little wharf rat! He couldn't have done all they said he'd done because he was standing there so small. But about a month later, I married him,'" she said. 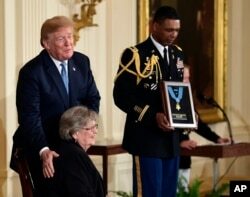 President Donald Trump speaks before he awards the Medal of Honor to 1st Lt. Garlin Conner as his widow Pauline Connor accepts the posthumous recognition, during a ceremony in the East Room of the White House in Washington, June 26, 2018. They lived a quiet, simple life on a Kentucky farm. Conner never talked about his actions outside Houssen, France, or any of the other battles he fought across North Africa and Europe. He is the second-most decorated service member of World War II, but his cousin Luther Conner said he never even displayed his medals in his home. "They were literally in a cardboard box in his old Army duffel bag in the bottom of the closet, in the living room closet," he said. Major General Leopoldo "Lee" Quintas, Jr., the current commander of Conner's Army division, told VOA the young first lieutenant wasn't even supposed to be on the battlefield that day because he was wounded and was "shot in the hip by a sniper prior to this event." "And he escaped from the hospital essentially, rejoined his unit," Quintas continued. "And the battalion commander said, 'Hey, we're going to keep you at the battalion headquarters. I'm going to make you the battalion intelligence officer to give you some time to recover because you've been injured.' So this attack comes, and he volunteers to go to the front." Conner, with nothing but a gun and a phone line, dashed onto the battlefield, holding off 600 Germans and six tanks coming at him as he called in artillery strikes from a shallow ditch. Military historian Erik Villard said Conner was "out in front of the American lines." The German infantry came within 10 meters of Conner's position, he added, "and the last phase of the assault, he basically called artillery on himself." Conner proved more than just a scrawny Kentucky farm boy, making his phone line the deadliest instrument on the battlefield as both German and American firepower bore down around him. Quintas said on that particular day and that particular moment in time, "I believe he was the most important person. His ability to call for fire, his ability to control that part of the battle was absolutely essential to the division winning the fight that day. Pauline Conner never learned the full depth of her husband's bravery until after he died at the age of 79. A team, including Pauline and Conner's cousin Luther, fought for nearly 20 years after Conner passed away to get his Distinguished Service Cross upgraded to the Medal of Honor — an upgrade made possible by the eyewitness accounts of three of Conner's fellow soldiers buried deep within records at the National Archives. And now, Pauline says she's proud her husband is getting the recognition he deserves. "He was my hero," she said, crying. "I loved him very much and I'm so thankful that I get to see this in my lifetime."